What happens when the world as we've known it becomes divided, when the mind becomes less able—or less willing—to distinguish reality from what is desired? 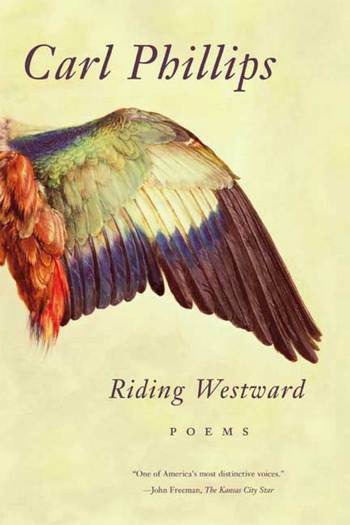 In Riding Westward, Carl Phillips wields his celebrated gifts for syntax and imagery that are unmistakably his own—speculative, athletic, immediate—as he confronts moral crisis. What is the difference, he asks, between good and evil, cruelty and instruction, risk and trust? Against the backdrop of the natural world, Phillips pitches the restlessness of what it means to be human, as he at once deepens and extends a meditation on that space where the forces of will and imagination collide with sexual and moral conduct. Carl Phillips is the author of eight previous books of poems, including The Rest of Love, a National Book Award finalist; Rock Harbor; and The Tether, winner of the Kingsley Tufts Poetry Award. He teaches at Washington University in St. Louis.